The Arqspin web-based spin editor includes a simple yet powerful curves tool that allows making complex brightness and contrast adjustments to your spins. The curves tool is accessed on the “Advanced Settings” tab in the editor. The curve editor shows a visualization of the spin’s intensity histogram, ascending from darker to brighter pixel intensity values. The position of the four control points on the curve can be adjusted by clicking and dragging with the mouse. Changing the shape of this curve causes a change in the distribution of the spin’s brightness values. The curve can be adjusted to make only certain intensity ranges brighter or darker. Next we describe some specific examples of how to use the curves tool to produce desirable edits. The curves tool is very useful for producing spins with a clean white background. Consider this spin of a teapot. The background is almost white and the edge of the turntable is visible. It’s often desirable to make the background perfectly white. Nice! Note how this result does a nice job of preserving the appearance of the teapot while saturating the background regions to produce a more professional look. The curves tool is also useful for adjusting the amount of contrast in the spin. This can make it easier to see and understand important details on an object. Let’s use the spin of a backpack below as an example. Note that it’s hard to make out the zippers and pockets because they are very dark and similar in color to the rest of the backpack. We can boost the contrast in these areas using the curves tool. We adjust the middle two control points to create a gently-sloping ‘S’ shape. A more pronounced ‘S’ shape will produce more dramatic contrast enhancement and a flatter ‘S’ shape will give a less dramatic effect. Note how the edited spin does a much better job of revealing the fine details in this product. 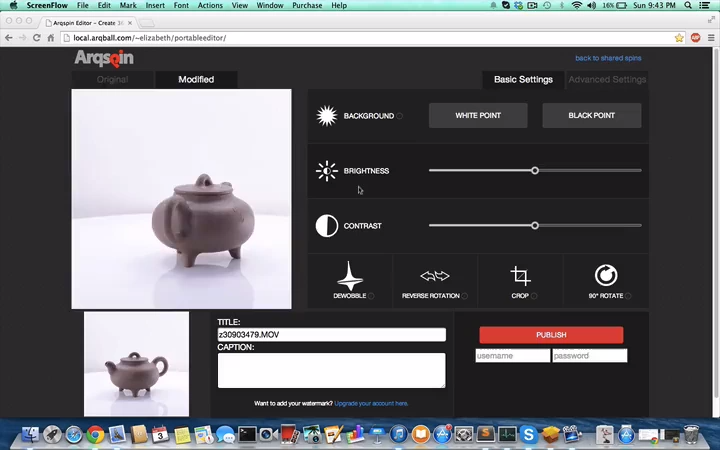 Below is a video that shows the complete editing session for the teapot. Check out the curves tool for yourself by creating your free Arqspin account today!